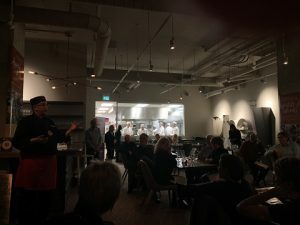 We attended the Cooking with the Wolfman: Indigenous Fusion Literary Dinner at the Stratford Chef School, October 25, 2018. 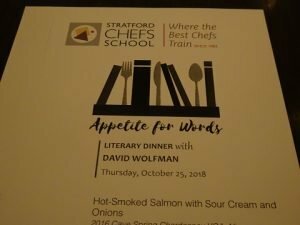 The event was a part of Appetite for Words, a Stratford literary festival with a culinary twist. The lineup for 2018, with the final dinner on October 28, also includes Jackie Kai Ellis, Jane Sigal, Jeff Crump, and Anna Olson. These dinner-brunch-lunch events allow attendees to be up close and personal with the chef-authors. Just what we love! Our Literary Dinner began with David Wolfman personally greeting dinner guests at the door. Chef Wolfman was relaxed as he addressed the room of diners. 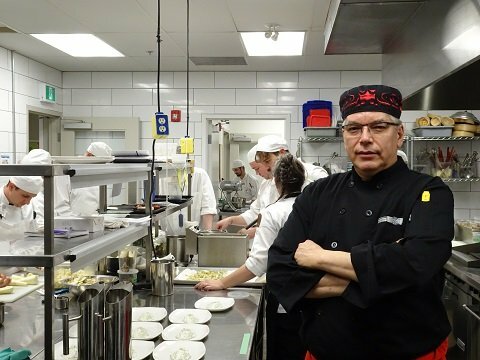 The real pressure was on the Stratford Chefs School’s student chefs who had prepared the Wolfman’s recipes. 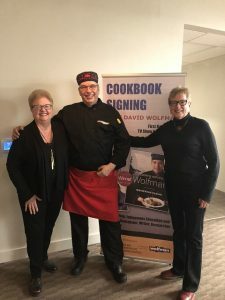 In his book, Cooking with the Wolfman, David Wolfman and his wife, Marlene Finn, combine traditional First Nations diet with European cooking techniques. The dinner menu reflected that combination. Our first course was Hot-Smoked Salmon with Sour Cream and Onions. Two deep-fried caper berries garnished each plate. 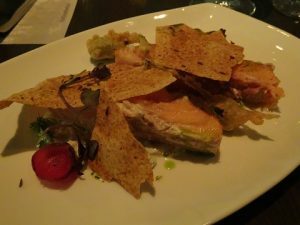 The salmon was tender and lightly smoked. The caper berries were fun. 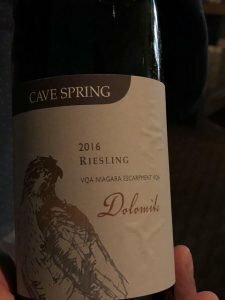 The salmon was paired with 2016 Cave Spring Chardonnay VQA, Niagara Escarpment, ON. 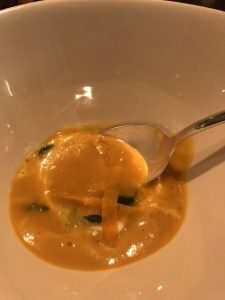 The second course was Sumac Squash Soup with Deep-Fried Sage and Hazelnuts.The soup was smooth with a hazelnut crunch. 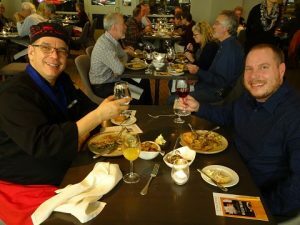 The main and third course was Métis Deer Tourtière with Oyster Mushroom Sauce, Caramelized Rainbow Onions, and Roasted Garlic Sunchokes. 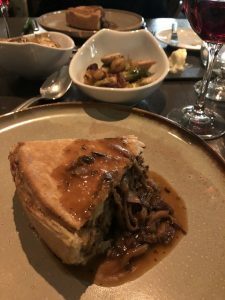 The tourtière was truly indigenous fusion – with traditional game and European buttery pastry. 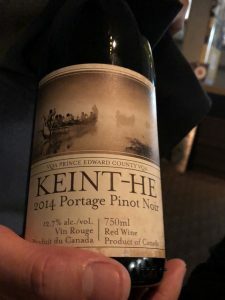 The wine was 2014 Keint-He Portage Pinot Noir, VQA, PEC, ON. 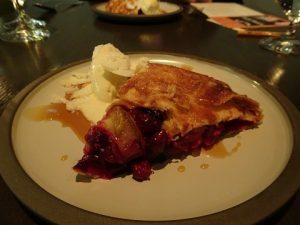 The final course was Pear and Cranberry Galette with Brown Butter Ice Cream. 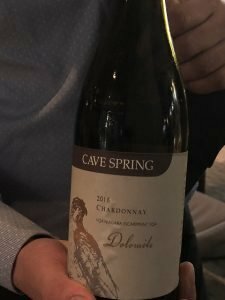 More mouth-watering tastes – traditional, natural tartness fusing with classical sweetness.